Ryder has loved to dance and move his whole life. Though it was only in the recent past that he found Contact Improvisation, and it was love at first dance. Ryder’s teachers include Alicia Grayson, Mark Young, Paul Singh, Elise Knudson, Hannah Wasielewski, Nancy Stark Smith, Tim O’Donnell, Gretchen Spiro, Steve Homsher, and Blake Nellis. Earlier this year, Ryder became a core member of the Boulder Contact Lab, which meets weekly in Boulder, CO. 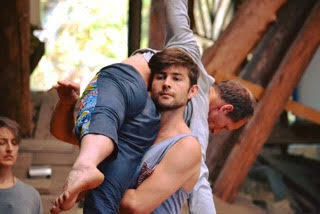 He was recently invited to dance with Tumblebones, a dance improvisation collective in Boulder. Ryder is beginning to create a performance based improvisation collective. In addition to dance, Ryder enjoys theater performance and was a member of Boulder Playback Theater. Ryder proudly works at Sage Programs, a Waldorf inspired homeschool program, teaching kindergarteners.